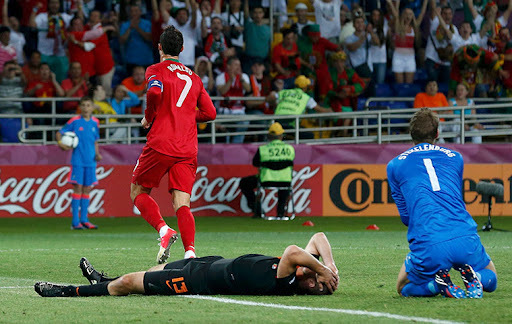 The Netherlands are out of Euro 2012 following Sunday’s loss to Portugal. We knew someone among the power trio of Germany, Holland and Portugal would not make it out of the Group of Death, but we didn’t think it would be Holland, the fourth-best team in the world according to the FIFA rankings. And we definitely didn’t think they would exit without picking up a single point in group play. They were done in by two goals from Cristiano Ronaldo, who finally decided to show up for the tournament. Ronaldo tied the game in the 28th minute and put the winner home in the 74th minute. Portugal advances to the knockout stage to face the Czech Republic on Thursday. Both teams advanced by bouncing back after losing their opening games in group play. Germany also advanced out of Group B, winning all three of its matches, and will face Greece on Friday.